I was a little bored of having same square or rectangle cards and thought of trying something circular. Since i didn't have any tools to cut circular shapes, i stuck to the traditional rounder, protractor and my lovely scissors!!! No mention of how i had to revise my geometry to find the center of the circle...etc.... But i guess the end result was satisfying. I have chosen the color scheme keeping in mind the Itsy Bitsy Logo Color challenge. Here are a few pics! Thats the image of the card when lying flat down. The image of the girl blowing bubbles is coloured using local water colours. Have added Hobby Ideas glitter dots on the edge. The roses are punched flower prima roses. That's the view of the card when opened. Its fun to make easel cards. They give a good view and are an easy click. A closer look at the inside of the card. The sentiment "Blow The Bubbles of Joy" is hand written. I was soo tired of finding a ribbon of my choice and colour that i ended up making a ribbon out of pattern paper and it gave an awesome look to the card!!!. Hope you enjoy seeing the card as much as i enjoyed making it!! DO leave back your comments, they mean alot to me. a very lovely and sweet shaped card! Your circle card is lovely. Amazing that you managed to do such nice shapes with your protractor and scissors! Thanks for taking part in the Daring Cardmaker's "Child's play" challenge! Thank u Miri for your kind words! 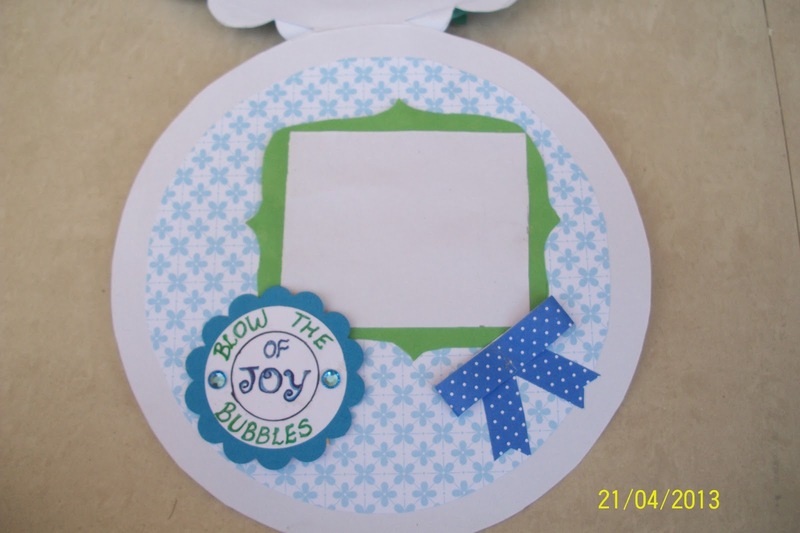 A circle card makes a lovely change as you say Bijal and this one is so very pretty. Super cute and wonderful card. This is super, I like that sweet little image! Thanks for joining our Shop Pumpkin Spice challenge this week!! Beautiful card. Thanks for joining us at stempelsonne. Such a cute little girl and your fancy fold is SO pretty! Thanks for sharing with us this week at Catch the Bug. You did a great job with the compass and protractor. Great color and design. Thanks for joining us at DigiStamps4Joy for this challenge. Thank u margaret for such lovely comment! Ahh....a Mo manning stamp =) I love them! And the sentiment just suits perfect! Lovely card and thanks for taking part at Stempelsonnen Challenge! Mo manning is my fav too!!! thanks!! Lovely card and such a cute little image. I've always liked the blue/green color combo. Thanks for joining us at Creative Card Challenges this week. OMG - A great card - I love it! Hey thank u soo much Anne.. I loved the image at a glance and wanted to use it in my new creation!!! Very pretty card! Thanks so much for playing along with us at 'For the love of crafting'. Good luck! Adorable card Bijal. Amazing Easel card, I can not believe you did this with scissors. Thank you for playing along with us at Pumpkin Spice's weekly challenge. Hey Asmah...those were really lovely words..Am touched...thank u so much! We’re so glad you played along with us this week for the Catch The Bug BINGO Challenge with Bugaboo Stamps! We hope you join us again this week for a new Bugaboo challenge! 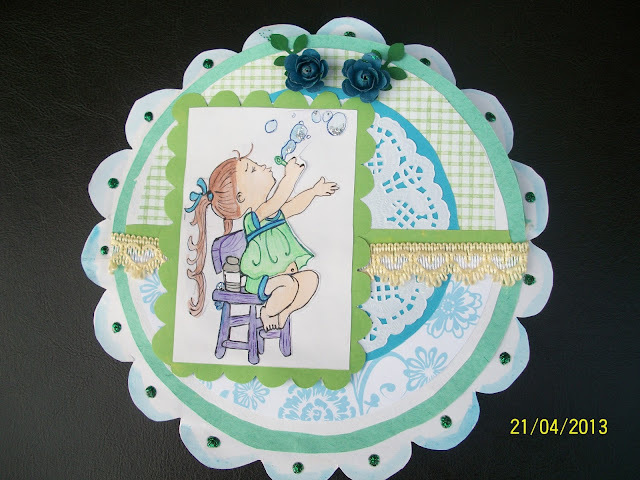 Lovely card.Love the pastel colours and the image is super cute.I am so amazed that you cut out the circle by hand.I can't even cut in a straight line with a ruler.lol.Thanks for playing along with us on Crafter's Corner Challenge # 7.All the best. Thank u so much Pallavi!! So pretty, what a lovely image! Such a sweet and endearing image Bijal. Must say I am very impressed with your hand cutting prowess! Too good! What a beautiful shaped card Bijal ..the way you have colored the image and your hand cut shape is simply awesome..beautiful embellishing too !!! Thank u so much hussena!! Lovely card Bijal.. Thank you for playing along with us at 'For the love of crafting'.